Thunzi Bush Lodge is situated in a tranquil 44-hectare malaria-free sanctuary of coastal forest and African bush and offers country style living 30 km from Port Elizabeth. Charming, cosy natural wooden chalets with private decks provide comfort for the enthusiastic nature lover and a two bedroomed chalet offers self-catering. A peaceful setting, beach walks, bass fishing, birdwatching with over 352 species, and forest walks spotting small game, such as bushbuck, blue duiker and vervet monkeys. Relax at the swimming pool in a private setting with views of the surrounding forests, or visit the giant sand dunes at Maitland beach 2 km away where sand boarding, fishing and horse riding can be enjoyed. Luxuriously furnished one bedroom chalet with full bathroom (oval bath for two and glass shower), fully-equipped kitchen with fridge, gas hob and convection/microwave oven, lounge and private balcony with spectacular views of the indigenous forest and wetlands. Added extras for your convenience include LCD flat screen, DSTV select, remote controlled ceiling fans & air-conditioning, mini chocolates, waffle weaved dressing gowns, tea/coffee amenities and biscuits. Luxuriously furnished one bedroom cabin comprising of en-suite full bathroom (oval bath & separate shower) with fully-equipped compact kitchen with fridge, gas hob and convection/microwave oven. Added extras for your convenience…heated towel rail, tea/coffee amenities and biscuits, DSTV Select, waffle weaved dressing gowns , remote controlled ceiling fans & air-conditioning, mini chocolates, heating, hair dryer and laundry facilities. French doors open from bedroom onto private balcony with spectacular views of the indigenous forest and wetlands. Comfortably furnished two bedroom (double & twin) family self-catering chalet comprising of full bathroom (bath & separate shower), lounge & dining area with open plan full kitchen. The private balcony leads from the lounge which offers breath-taking views of the indigenous forest and wetlands. A highlight for this chalet is its own private boma area situated in the indigenous forest where family and friends can sit around a cosy fire and enjoy their drinks while having a braai (barbeque). Added extras for your convenience include DSTV Select, Air-conditioning, waffle weaved dressing gowns, ceiling fans, tea/coffee amenities and biscuits, mini chocolates, heating, hair dryer. Daily housekeeping service and laundry facilities. Comfortably furnished two bedroom family self-catering chalet comprising of two bedrooms with open plan bathrooms (separate toilets) and lounge with fully equipped open plan kitchen. The private balcony leads from the lounge and offers breath-taking views of the indigenous forest and wetlands. A highlight for this chalet is its own private undercover braai area where family and friends can sit around a cozy fire and enjoy their drinks while having a braai (barbeque). Added extras for your convenience include various DSTV channels, waffle weaved dressing gowns, air-conditioning, tea/coffee amenities, mini chocolates, heating, hair dryer, daily housekeeping service and laundry facilities. Comfortably furnished three bedroom family self-catering chalet comprising of two bathrooms (main en-suite - full bathroom with oval bath & separate double shower, additional bathroom with shower only), lounge with fully equipped open plan kitchen. The private balcony leads from the lounge and two bedrooms offering breath-taking views of the indigenous forest and wetlands. A highlight for this chalet is its own private undercover braai area where family and friends can sit around a cozy fire and enjoy their drinks while having a braai (barbeque). Added extras for your convenience include various DSTV channels, waffle weaved dressing gowns, air-conditioning, tea/coffee amenities, mini chocolates, heating, hair dryer, daily housekeeping service and laundry facilities. 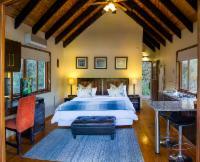 "Our stay at Thunzi Bush Lodge was lovely and it was just what the doctor ordered. The staff was extremely helpful and they arranged a lovely picnic setup at one of the picnic spots. I would definitely recommend Thunzi Lodge as we had everything that we needed at our chalet in order to make our stay memorable and worthwhile. Kind regards "
Follow signs from PE Airport to Seaview (M15). When you get into Seaview town turn left into Elizabeth Road (or follow signs to Maitland Beach). Once you have turned into Elizabeth Road (which is opposite Spar Complex) drive for 9 km. You will see a Thunzi Bush Lodge sign, 100m after this sign make a sharp left turn into Entrance Gate.